Shares of chipmaker Advanced Micro Devices (AMD) have had a decent rally since the company reported Q4 results last week. While the report wasn't a home run by any stretch of the imagination, it wasn't the disaster we've seen with a number of others in the space. Unfortunately, the rally took a small pause on Tuesday, after continuing the recent trend of both good news and bad for the company. 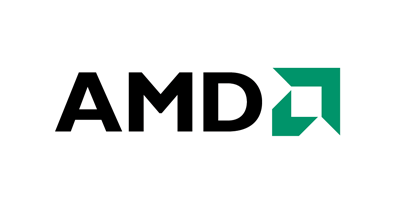 AMD shares were down 3.4% on Tuesday after Mubadala Investment, the Abu Dhabi state fund, disclosed selling nearly 35 million AMD shares. Mubadala has been a major holder of AMD, starting in 2007, but has gradually reduced its position over time. The investment fund also announced its plan to convert 75 million warrants to equity, which will leave it with about a 6.9% stake in AMD. This conversion will give the chipmaker about $450 million in cash. As the title of my article details, this is both good news and bad. First, you never really want to see a major holder selling their position, and converting the warrants means that AMD's share count will rise a bit. By moving the warrants to shares, you also wonder when Mubadala will come in with its next major sale. On the other hand, this provides the chip company with a significant cash infusion that will certainly help. As for the company's earnings report, I found the numbers to be a mixture of good and bad. My Estimize prediction was revenues of $1.414 billion and non-GAAP EPS of $0.08. The company was a little ahead of that on the top line, but that missed Street expectations, while in-line on the bottom line. Gross margins also rose quite nicely, helping the company shift from a loss in Q4 2017 to a profit this time around. Guidance is where things ended up really mixed. Management expects a Q1 revenue midpoint of $1.25 billion, which was about $200 million below estimates. 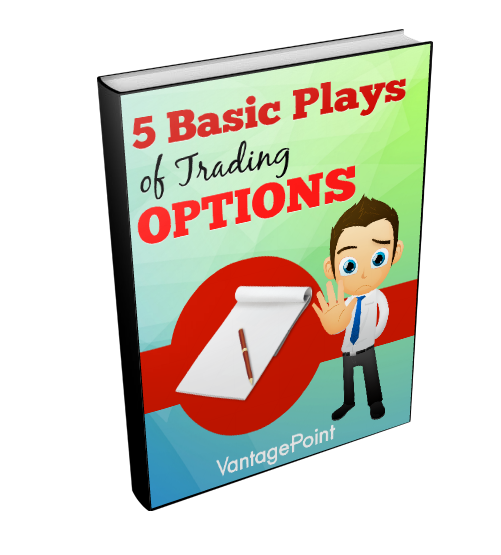 This wasn't a total shock, because we saw competitor Intel (INTC) give a very weak forecast with its report, and Nvidia (NVDA) came out and provided a large revenue warning as well. As I've continued to discuss, the late 2017/early 2018 cryptocurrency boom made for some tough comparisons, and we're now feeling those impacts. The China trade war isn't helping, and the US economy may slow a bit thanks to the government shutdown that will impact GDP this quarter. The reason why shares rallied after the report is that management called for 2019 yearly revenues to grow in the high-single digits, percentage wise, over 2018. Since the Street was only looking for 6% growth, that was seen as very nice guidance given all of the worries surrounding the chip sector. In the chart below, I've shown basically where quarterly estimates stand vs. their 2018 respective periods. Now the company does have some product launches scheduled for the year, so growth is expected, especially in the back half. However, I would certainly have liked to see a bit more balance in these quarters, especially since current estimates imply quite dramatic growth in Q4. All it takes is a week delay here or there with a launch and things can easily miss. 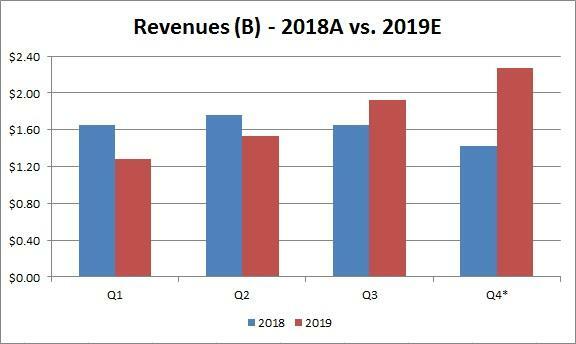 Right now, about 60% of the year's revenue is expected between Q3/Q4, compared to last year when those two periods were a little less than half. The one thing I now want to hear about is management's plan for the cash coming in from the conversion of Mubadala's warrants. AMD finished Q4 with about $1.15 billion in cash and equivalents, against $1.25 billion in total debt. I expect that we'll continue to see some more of the high rate debt paid down, and that will certainly help the income statement even more. However, does management now change its capex or R&D plans for the year, knowing it has more financial flexibility moving forward? In the end, it's been a mixture of good and bad news for AMD, but that's enough for shares to have somewhat of a relief rally. While the company's short-term forecast wasn't great, greener pastures are expected as the year progresses. Unfortunately, Mubadala continues to sell, and while the warrant conversion means dilution for shareholders, it brings a nice chunk of cash for management to put to use. If AMD's revenue growth comes in this year as planned, we could see shares retest their 2018 highs.